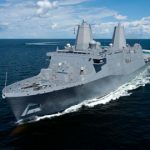 Huntington Ingalls Industries (NYSE: HII) has received a potential $242 million contract to provide life-cycle engineering and related services for the U.S. Navy’s LPD 17-class amphibious transport dock ships. The cost-plus-fixed-fee contract covers systems integration, class material readiness, ship alteration installation, design services, obsolescent management, logistics and training support, data management and other services, the Defense Department said Wednesday. Work will occur at the contractor’s facility in Pascagoula, Mississippi, through December 2016. LPDs are designed to take on board conventional landing craft and expeditionary fighting vehicles used to transport Marines and their cargo. The 684-foot-long ship works to support expeditionary warfare and amphibious assault missions and provide launch support for tilt-rotor military aircraft and helicopters.